Italian painter. He was a talented artist who perhaps is more famous now for his copies and pastiches of other artists work than for his own. For some years Caroselli had worked in a very stylized Caravaggesque manner peculiar to his himself, producing works of great quality, such as Allegory of Vanity (Longhi Collection, Florence) and Lesbia Mourning her Pet Sparrow (private collection). Up to around 1630 it becomes very hard to distinguish the work of Caroselli and his pupil Pietro Paolini whilst they were both working in this Carosellian Caravaggesque manner. 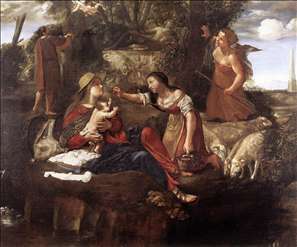 His Plague at Ashdod (National Gallery, London) is a copy after Poussin s painting of the same theme, but it is more than a mere copy. Carosellis painting was commissioned in 1630 by the Sicilian art collector Fabrizio Valguarnera while Poussins version, also commissioned by Valguarnera, was still underway. This painting is considered one of Carosellis finest works, and it is one of the most distinguished reminders of the plague of 1630 in Rome.